Tony Smith. Please Note: Whilst every care is taken in checking promoted links, we cannot accept responsibility for your use of third party web links. Nostalgic Nursing Memoirs was a new and personal concept from Anthony P Smith, originally prepared for a Website (long gone!). In 2004, when in my early seventies, one tends to nostalgia, admittedly with the occasional use of ‘rose-tinted’ spectacles! I have always had a keen interest in social history from the 19th century, and up to the first half of the 20th century. With a lot of help from the Internet, I was able to resume my studies again. In 1952 I commenced a career in the nursing profession, so when I retired in 2000, I had completed 48 years! I am sure that there must be other folk who would be willing to share their own nursing experiences, after reading mine in these few pages? Interestingly, thanks to social media sites like Friends Reunited, I was very fortunate to make contact with several contemporary colleagues from my very first training hospital, exchanging some interesting memories! 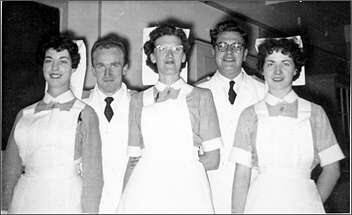 I am sure that many of us, who started our nursing training in the early 1950s, must look back on our training and query mentally, whether the modern nurse doesn’t appear to be as well trained as we were! Perhaps this is not always correct, as our systems of training were so very different then. However, most of we retired genre, will mostly recall our own training hospitals with pride! Does the modern system through its local colleges, now with their associated universities do the same for their graduates? I am not entirely convinced! 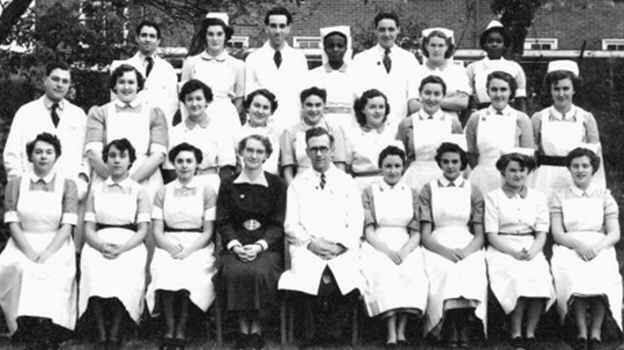 It was over sixty years ago on Monday, 14th July 1952 that a group of we, mainly young people, commenced our student nurse training at the West Middlesex Hospital. Our first memories will be mainly of the twelve weeks in the Preliminary Training School (PTS). 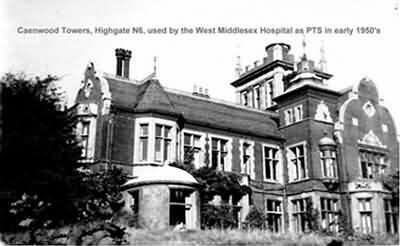 The hospital had a large, Victorian mansion called Caenwood Towers, on the edge of Hampstead Heath, where we student nurses (which comprised 30 ladies and 5 men) were housed. We had come in from many different backgrounds e.g. factories, offices and retail, also some had joined us straight from school. Once a week, a coach would take us back to the hospital at Isleworth, to work a day on the wards, under close supervision of the more experienced ward staff. Most of us, on return to the ‘safety’ of the PTS, admitted great apprehension on the wards in those early days! I recall a couple of years further on into our training, when we were the ‘more experienced staff’, wondering what the new batch of PTS student nurses would be like! Our training in PTS was thorough, thanks to the very able tuition from our two ‘Sister Tutors’ (or ‘Nurse Tutors’ today), Sister Hodges and Sister Ashby, who were very patient with their rather ‘green’ trainees! 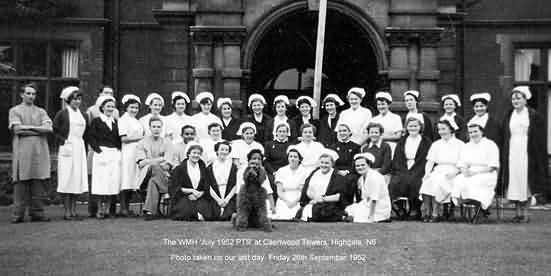 We were told that in 1952 the cost of training one nurse was £3000! Every Friday morning, the Principal Tutor, Miss Saddington, came out from the hospital to check on our progress. I do recall that she was an elderly lady, and it was rather like being inspected by Florence Nightingale! Our studies were very challenging, especially the subject of anatomy and physiology, (the terminology was just changing over from Latin to English names, thankfully), ‘them bones … them dry bones’! Practical nursing was always interesting, but some of our early attempts at bandaging sometimes had us resembling mummies! Hygiene was for me, a most interesting subject, especially our various field trips to sewage farms, dairies, etcetera..
We were situated on the edge of Hampstead Heath. Our third week in PTS corresponded with the old type August Bank Holiday, which was held on the first Monday in August. Our tutors promised us that if we worked extra hard that day, we could finish earlier so that we could visit the fun-fair on the Heath in the evening! This was something very different for us on that far off summer evening. Our tutors even kindly brought the evening meal forward for us that day! Also we used to enjoy trips out in small groups to nearby Highgate village. Some interesting shops, I remember buying some of my first nursing textbooks there. Our immediate neighbour was Kenwood House, which nowadays is a popular venue for open air concerts. Also nearby there was an old, popular public house, the Spaniards’ Inn, which is still there today. As time progressed, so did our confidence. I would like to think that at the end of our first year, we had made useful contributions on the various wards that we had been allocated to. I can still remember the experiences on the TB ward (See colour photo and note further down). Ironically, having today closed most of these units some time ago, there is a need to open them again. 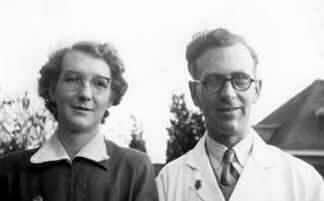 Also, in those early days, I was very fortunate to have worked under one of the leading pioneers in the field of geriatrics, Dr Marjory Warren. What I learnt under her able tuition then, meant that I was able to nurse any ‘stroke’ patient more competently in the subsequent years. I was also able to pass these skills on to my newer colleagues! I spent the first two years of my nursing training at a large hospital of 1100 beds, west of London, the West Middlesex Hospital, Isleworth. was Miss Alice M D Leslie. It was handy getting from one side of the hospital to the other, to use a bicycle, which several of us did! I started here training as a student nurse, but unfortunately, I failed the Preliminary exam twice. So for the last six months I became a pupil nurse! After obtaining my SEN qualification (i.e. State Enrolled Nurse), I moved to a smaller hospital in Kent, the West Kent General Hospital, Maidstone, (at this time the hospital only had 141 beds), to continue my general training. The Matron there was Miss Ellen M Griffin (who was trained at Guy’s Hospital). It was an added bonus for me to have attended a second PTS of twelve weeks! My varied experiences at my first hospital were invaluable, but the smaller training hospital gave me some very unique opportunities there! Rochester, Leybourne Grange at West Malling, also Preston Hall which was a TB hospital. Then my own training Hospital - the West Kent General Hospital in Maidstone. Six of us in the PTS were from the WKGH, comprising four ladies and two men, and there were actually three of us who had the SEN training! The GNC deducted three months from my SRN training, which was very encouraging. We students all had a very thorough grounding in our twelve weeks of study in PTS, thanks to our two very able and kindly tutors, Miss G Ferris and Mr K Darley (see photo below). At the time of my training the old WKGH only had 141 beds! The building was built in 1832, and served Maidstone until the late 1960s. I understand that now there is a very fine and large district hospital built on the outskirts of the town on the site of the former psychiatric hospital. We had the polio outbreak in 1955, and had to nurse several patients in ‘iron lungs’. One unforgettable incident occurred, when I was on night duty. I was detailed to nurse a child recovering from polio in a side room on the Children’s Ward. The young patient had been in an iron lung, and I was told to ‘special’ him all night. I was told by the night sister – "Even if the hospital fell down, I was to stay with my patient!” There was a dreadful thunderstorm that night! In the morning, I discovered that flash flooding had flooded the cellar to within a foot or so of the main electrics! The fire brigade had to pump out the cellar. Apparently some cots had to be moved because of flooding in the Children’s Ward. My young patient had a very comfortable and quiet night, and I probably had the most peaceful night of all my colleagues! Historical Note – I qualified in 1957. Sixty years before, in 1897, Maidstone experienced a dreadful Typhoid Epidemic starting in August and continuing for several months. On the 15th October Edith Cavell, with five other Nurses from the London Hospital, was sent by Eva Luckes to help with the emergency. 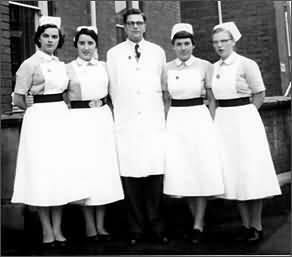 Once I had qualified as an SRN in the 1950s, as a male nurse it was advisable to take further training if one was to advance professionally. I chose to train as an RMN (i.e. Registered Mental Nurse), and commenced my training at Oakwood Hospital, a large psychiatric hospital on the other side of Maidstone. This was to prove to be a challenging and most useful experience. There were many contrasts between ‘mental’ and ‘general’ nursing. I discovered prejudices existed in both sectors against each other! My subsequent time in the psychiatric field was greatly aided by my general nursing training, which I never forgot! On commencing this training, I found that I was considered a ‘post-graduate student’. As such, our governing body, the General Nursing Council decided that I was only required to complete an 18 months training, instead of the usual two years. I was the very first student at Oakwood to gain this concession! This was a large mental hospital, designed by the same architect who designed Maidstone Prison. Both places were built about 1840 on opposite sides of the town. I had only been there for a few weeks, when there was a dreadful fire at the hospital; this made the national news. The fire was found to have started in the tailor’s workshop, and took the whole weekend to extinguish. Whilst no patients or staff were injured, sadly three firemen were killed, and six of the fire crew were injured when some of the wards collapsed. In the subsequent months of the major rebuilding needed, many patients allocated temporary beds in various, different local hospitals. The development of the major tranquilliser chlorpromazine (‘Largactil’) in 1953, revolutionised the care of the psychiatric patient. Over sixty years later, this drug is still available. 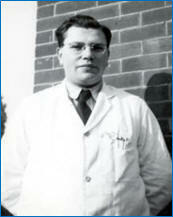 One of the treatments commonly used in the 1950s was the giving of large doses of insulin to induce a coma. This was reversed with large amounts of glucose solution, using a nasal-gastric tube. I am very pleased to say that this horrific therapy was phased out by the early sixties! The other widely used, and controversial treatment was electro convulsive treatment (ECT). This entailed the intravenous injection (separately) of atropine, then a short- acting barbiturate followed by a muscle relaxant. After which, saline type soaked electrodes were applied to the temple regions of the forehead, resulting in a controlled, modified convulsion. Both these treatments were thought to benefit patients with schizophrenia. ECT was found to be especially beneficial in the treatment of depression. 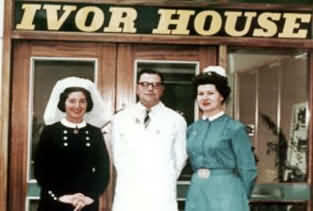 Following the completion of my RMN training, I remained at Oakwood Hospital as a Staff Nurse for a year or so. I then applied for a post as a relief Charge Nurse, working at the local geriatric hospital (Linton Hospital, Coxheath) which was on the other side of Maidstone. I enjoyed working there for four years. 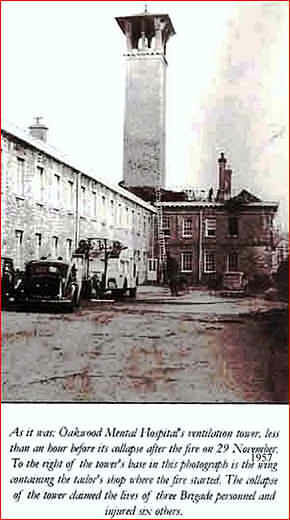 As well being a geriatric hospital, the hospital also had two wards (a male and female unit) for medical and orthopaedic patients who had been transferred the West Kent General Hospital in town. My double, nurse training proved invaluable! Sometimes, when on night duty, I would find myself responsible for the entire hospital, without resident medical cover. When emergencies arose, we had to bring a doctor in. 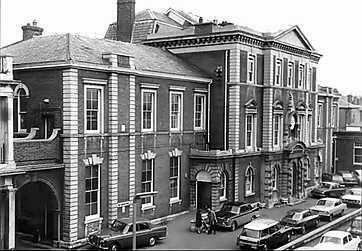 Then in 1964, there appeared a nationally advertised post for a Charge Nurse’s post in the recently opened psychiatric day hospital in Somerset, (Ivor House Social Health Centre, Taunton). My application was successful! So the next ten years there proved to be a very challenging and interesting time in my career! We were administered by the main psychiatric hospital (Tone Vale Hospital), located about four miles out of town, our unit was in the centre of Taunton. As a ‘day care’ unit, we were able to offer support and treatment to patients from a fairly wide catchment areas on weekdays, Monday to Friday. As we were closed at weekend and public holidays, for seven years out of the ten years I was there, I worked at the local general hospital, (Musgrove Park Hospital) every Friday evening, and also every Saturday night! I found it very tiring, but was most necessary our young family! Also, it was very good to keep in touch with general nursing. In 1974 came the Re-organisation of the NHS, and with it, many changes. After ten years at the above unit, I was re-assigned to duties as a relief Charge Nurse at Tone Vale Hospital, where I was to remain for the next six years. The Conditions were not ideal, and the long day shifts were difficult. Finally, in 1980 I left the NHS! At first I worked as an agency nurse, then latterly worked very happily as a Charge Nurse in a couple of local nursing homes. So when I retired in 2000, I had completed 48 years as a nurse!